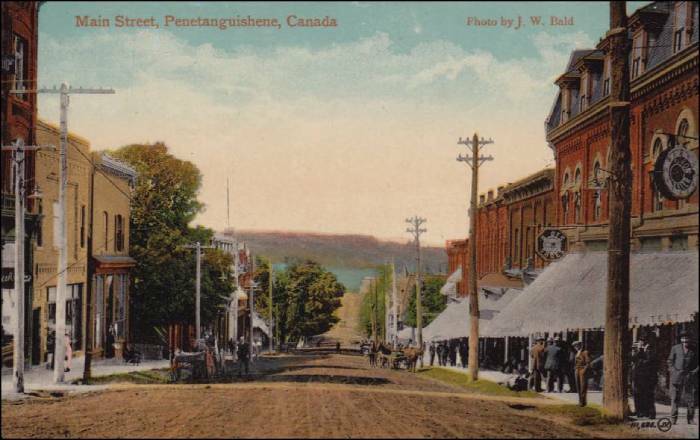 Main Street Penetanguishene, the early years. Brenda Jean 'Case' BAZINET was born and raised in Penetanguishene, Ontario. She is a direct descendant of the captioned couple, see her Pedigree Chart. Click on the underlined to see a Journal in descendant format of that family. Ancestral Families connected to Brenda's father Joseph BAZINET - DUBEAU; VALLEE - CHEVRETTE; CONTOIS - LAFRENIER; BOTTINEAU - DESJARDINS. Ancestral Families connected to Brenda's mother Delma LADOUCEUR - GIROUX; VALLEE - SOUSCHERAUX; DESJARDINS - GENEREAUX; LEGAULT - QUESNEL.